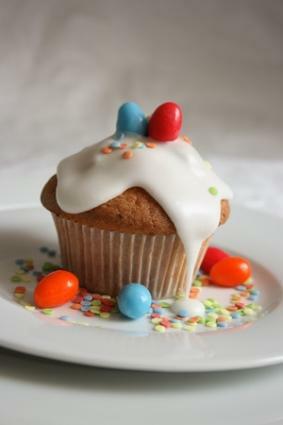 Easter cupcakes are fun and easy. Fun Easter recipes can bring a touch of whimsy to your Easter holiday. The great thing about fun Easter recipes is that they don't have to be expensive or involved to make. With just a little creativity you can have a fun meal for your family. If you involve your kids, these recipes can be a family activity that just may become a brand new Easter tradition. Dessert is a great way to have a little fun with your Easter meal. You can buy prebaked items or make your favorite baked item and decorate it. Breakfast or brunch is another way to add some joy to your Easter. The following fun Easter recipes offer up two desserts and one hearty breakfast that you can make quickly and easily. If you have baked the cupcakes yourself, allow them to cool. Frost the cupcakes with white icing. Sprinkle coconut over the icing to make fur. Cut the large marshmallow in half across the width of the marshmallow. Shape the marshmallow halves into ovals. Dip the cut side of the marshmallows into the pink sugar sprinkles to make ears and place on the cupcake. Use a jelly bean to make the nose. Use mini marshmallows to make teeth and place below the nose. Use skittles to make the eyes. Mix the cake according to package instructions. Grease and flour a 1-1/2 quart stainless steel bowl. Pour the cake mix into the bowl and bake for 70 minutes or until a toothpick inserted in the middle comes out clean. Cool the cake in the bowl for 15 minutes. Unmold the cake onto a wire rack and allow to cool completely. Carefully flip the cake over and place it on a cake plate or serving platter. Cut a circle out of the center of the cake with a one to two inch border. Frost the cake, including the center crater. Place several drops of green food coloring in a Ziploc bag and add the coconut. Shake to coat the coconut with green. Fill the crater of the cake with the green coconut. Pile Easter candies on top of the coconut, just as you would fill a real Easter basket. Arch two long pipe cleaners over the cake and wrap the pipe cleaners with ribbon to make a handle. There's no need to skip the most important meal of the day - even on Easter. Make these Easter egg nests for a fun and fantastic Easter brunch. This recipe tells you how to make it in one large baking pan; however, if you'd like, you may create individual servings in a muffin tin, as well. Mix shredded potatoes with grated zucchini and press into a buttered 9x13 casserole. Put in the oven and bake for 25 to 25 minutes. Remove from the oven and reduce heat to 350 degrees. Using the back of a large wooden spoon, place as many indentations as you'd like servings evenly spaced throughout the potatoes. Carefully crack one egg into the center of each indentation. Lightly season with salt and pepper and top each egg with crumbled bacon. Return the pan to the oven and bake. Remove the pan from the oven and sprinkle each serving with cheese. Using a spatula, carefully remove each serving and place on a plate.